If you're new to slots, there are a few basic things we should cover to bring you up to speed. If you're an old hand at the bandits, there are some not so basic things that might be good to read up on. Let's begin this word to the wise by looking at the numbers. A slot machine's house edge is expressed as a 'payback percentage'. What is a "payback percentage" and why should you care? The payback percentage is the average return on your so-called "investments" in one-armed bandits. In Nevada, for example, slot machines are required to give players an average payback of at least 75%. This means that a machine over the course of its life, must pay out at least 75% of what is fed into it. Most slot machine percentages are much higher than 75%, and average payback percentages are often advertised by casinos who maintain high percentages. The slot machine operator can change a chip in a slot machine to alter its payback percentage at any time, as long as the machine meets the minimum requirement. These days though, the chips are installed in the factory, and little if any alteration takes place at the casino. But many of you knew this already, so is there anything to learn, are there any real slot machine tips? Perhaps. It is not uncommon in Las Vegas and other gambling Mecca's to see casinos advertising rather good looking payback percentages, in the high 90s. You have to be careful of these ads however, as they can be a little misleading. Most people would presume that if a machine has a 99% payback percentage then putting $100 into it should return $99. But is that advertisement referring to a progressive machine? If so it's probable that the jackpot has been worked into the theoretical return percentage. This means the machine only pays back 99% if you include the jackpot being hit. In the meantime, until that jackpot is hit, the casinos make a killing eating up a large percentage of the money put in the machines, depositing it into the bank and making interest off of it. By the time the actual jackpot gets hit, the casino barely minds, they've made so much off of the machine. It can happen though of course, that jackpot can be hit, it even must be at some point. This is the casinos rub when it comes to slots. Players are convinced with well-worded advertising, that a single pull could change their life forever. It's the embodiment of the American dream, money for nothing, with no work and no effort. I don't recommend you play slots with the intent of getting rich off of a lucky pull one day. Rather, I recommend you play for the entertainment value, the small wins that come every once in a while, and perhaps as a distraction from other casino games. To get the most out of your slot machine play, and to immunize yourself from the nonsense other slots players may spout occasionally, you should keep reading. Most machines 'reward' you for playing the maximum number of coins. Better stated, most machines rob you of winnings when you fail to play the maximum number of coins. Casinos usually throw in disproportionate payoffs decided by the number of coins you play. For instance a machine may pay 1000 for 1 coin played, 2500 for 2, and 4000 for 3 coins played. 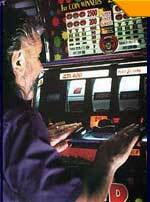 Some slot machine tips books will say that you should always play the max coins. I disagree a little. I think each machine should be looked at individually; if the max coins incentive is not so significant, you may want to play on a large denomination machine with just one coin, as opposed to a smaller denomination machine with max coins. Most casinos return more as the coinage goes up. In case you haven't played before, here are a few tips that slots players often learn the hard way, but shouldn't have to. Never leave or put coins into a machine that owes you money. Sometimes a machine runs out of money, if you leave the machine or hit buttons or put more coins in, you can destroy the evidence that the machine owes you anything. Instead, call for a manager without leaving your post. Repeat, don't leave the machine physically, just yell for an attendant. You should always look for banks or carousels of machines that advertise their pay-out rate specifically. A lot of advertising that states 'our machines pay at 98%' may only be referring to a small set of machines. If a bank of machines advertises a certified rate, it will most likely be better than the floor's average. Ensure your slots club card is in the machine and the light indicates as much. Those card readers are getting old and need the occasional adjustment. Finding the best slot machines is often quite a task. There are many myths propagating around placement within casinos of tight and loose slots. Those are just myths. If you want to find machines that have higher payout percentages then look for banks of machines that are advertising specific percentages just for that bank. If you want to know which casinos offer the highest payout percentages then look no further. The wizard of odds has put together a list, based on actual experience, of which casinos in Vegas return the most on their slots.